Whether you are hauling a payload or simply driving around Dover, drivers expect their vehicle to come to a stop in a safe manner. The Ram 1500 provides drivers with the peace of mind they seek by including best in class 14.9-inch brakes. These brakes reduce the stopping distance making for a safer drive. Being in a vehicle as large as a pickup truck sometimes makes parking a difficult activity. 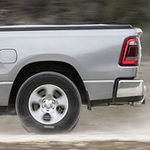 The Ram 1500 has the available Parallel and Perpendicular Park Assist system to provide aid during these instances. With this system, the driver controls the brakes, gear position and accelerator while the system controls the steering to effectively park.